Brand NEW Wii U High Definition Component Cable. 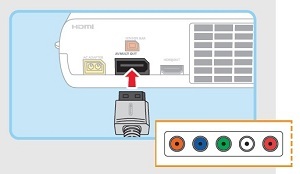 The Wii U comes with only an hdmi cable -- if you have a high definition TV with no HDMI slot -- You Need This Cable!! Get the most out of your Wii U's graphics by upgrading to this cable if you have a high definition television!